CUSTODY BATTLE: Crowe to his date with the hangman, despite the deadly threat posed by his prisoner’s gang. If you’ve suffered through gratuitous updates of old movies, such as The Wicker Man, I Think I Love My Wife, Halloween and The Invasion, you’re in for a treat. “New and improved” is a phrase that doesn’t often apply to these deals, but the latest from Walk the Line director James Mangold is almost enough to give remakes a good name. The 1957 original is a solid, though hardly classic, Western about a struggling Arizona rancher who hopes to reverse his fortunes with a highly paid gig escorting a charismatic killer to the train set to take him on a one-way trip to the gallows. It starred Glenn Ford and Van Heflin and was based on a story published four years earlier by Elmore Leonard — obviously an alien who does not exist in Earth time. The new film is bloodier, smarter and far more psychologically complex. Russell Crowe is in fine form as Ben Wade, a Bible-quoting stagecoach robber who leads a gang of killers he himself describes as “animals.” As the movie opens, he and his men have appropriated a nearby herd of cows to corral a group of Pinkertons on a secluded pass. The herd is the property of down-to-his-last-dime rancher Dan Evans, played by the shape-shifting Christian Bale. Evans and his two young boys track the missing beef to the scene of the crime and stumble on the robbery in progress. Once discovered, they’re graciously allowed to surrender their horses and leave alive, a generous impulse that comes back to bite the bandit big time. 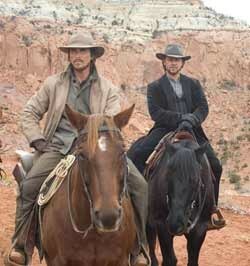 Because Bale promptly hikes into Bisbee to talk to the marshall. Crowe pays the place a visit as well, to bed and then leisurely sketch a raven-haired barmaid. He’s lightning fast with a pistol, but not as quick a draw when it comes to his sketchpad — a delay that allows local authorities to capture him before he can join his men on the outskirts of town. Bale accepts an offer of $200 from the burg’s top Pinkerton to join the small band of men who are willing take their lives into their hands by escorting Crowe to that train as the outlaw’s gang shadows them just out of sight. His move might appear impulsive and implausible for a husband and father of two, were it not for the excellent job screenwriters Michael Brandt and Derek Haas do to lay its foundation. As winning as Crowe’s character is, you can’t help feeling for Bale’s, who’s suffered such a long run of bad luck that he’s lost a leg, the affection of his wife (Gretchen Mol) and the respect of his older son (Logan Lerman). He’s also this close to losing his home. When the rancher’s son unexpectedly joins the group along the way, the mission becomes more than merely a way for him to pay his mortgage. It’s a way to prove himself to the boy. The handcuffed outlaw is a cunning judge of character. Something in Bale connects with this, and the dynamic that develops among the three characters makes for a riveting exploration of human nature. The film sheds light on some of its darkest, most desperate corners. Others, key to the motivation of central figures, resist illumination. The final act will leave many a seasoned psychologist scratching his or her head. While one or two of the film’s plot points are baffling, all of it is first-rate fun, and the Wild West action is wilder than just about anything we’ve seen since the gory days of Peckinpah. Mangold and Leonard prove a marriage made in High Noon heaven. Both are pros at telling stories about men forced by circumstance to test their limits. The author’s been at it for more than half a century, of course. The director showed he’s no slouch with 1997’s Cop Land, a picture that contains more than a few parallels to this one. With 3:10 to Yuma, Mangold succeeds in transporting all aboard beyond the blockbuster badlands of summer and on toward the far more fruitful cinematic plains of fall.